What an incredibly gorgeous litter with lots of good coloring! 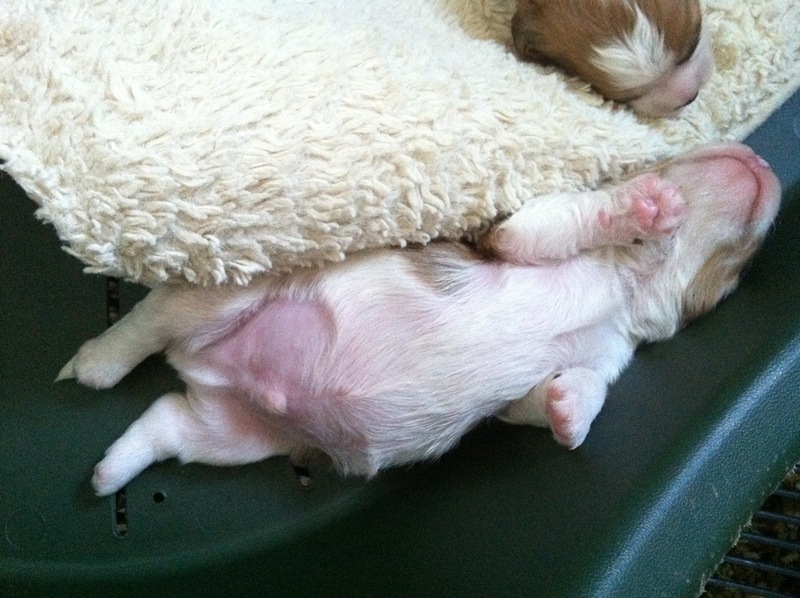 Daisy’s litter is simply thriving and they are growing into fat and sturdy puppies. Here is a quick look at them on their one week old birthday. The female has more white on her body and her sable color is a bit lighter. The face shot is of her. These puppies are robust and will be a healthy 16-22 lbs as adults. Nursing with mama! The girl is on the right, and her brothers are on the left! This is what a “hot dog” looks like in the summer in the nursery! This was one of those scorching days in July, and when I came into the nursery to check on the pups, this little guy was sprawled out on his back, trying to stay cool! Nursing again. They all have great color and they are growing to be nice and fat!! 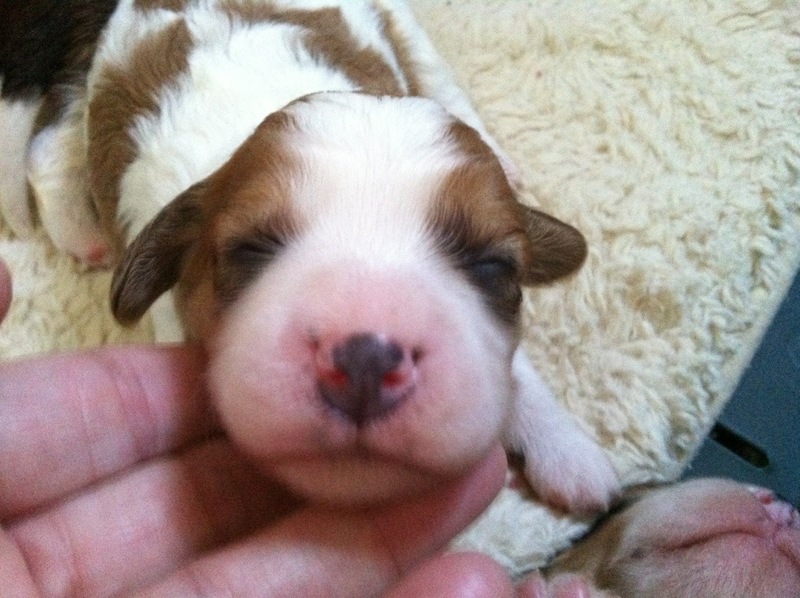 This entry was posted in Available Puppies, Cavachon, Daily Dog Stuff, Daisychon, Pujo, Sable & White. Bookmark the permalink. Are these puppies tri color? I can’t tell from the pics:). Thanks! 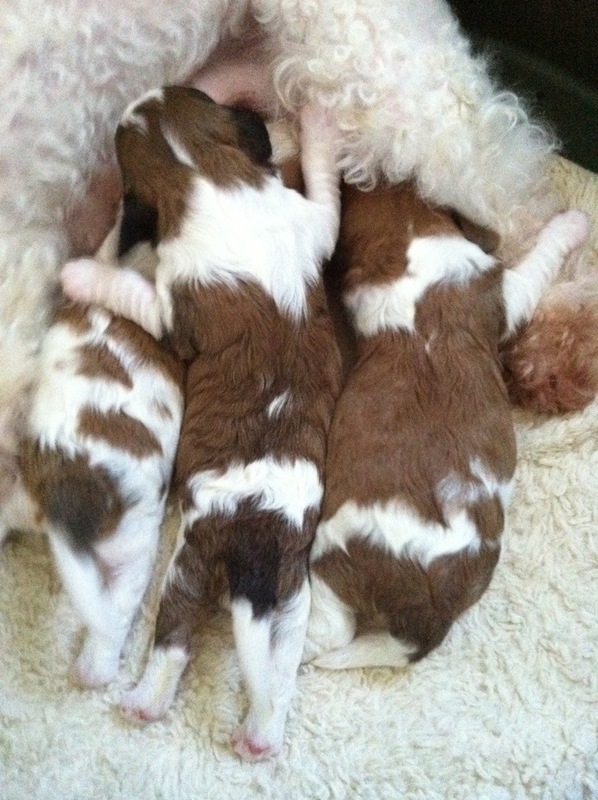 All 3 pups are sable & white. A Tri colored pup is black & white with tan points. 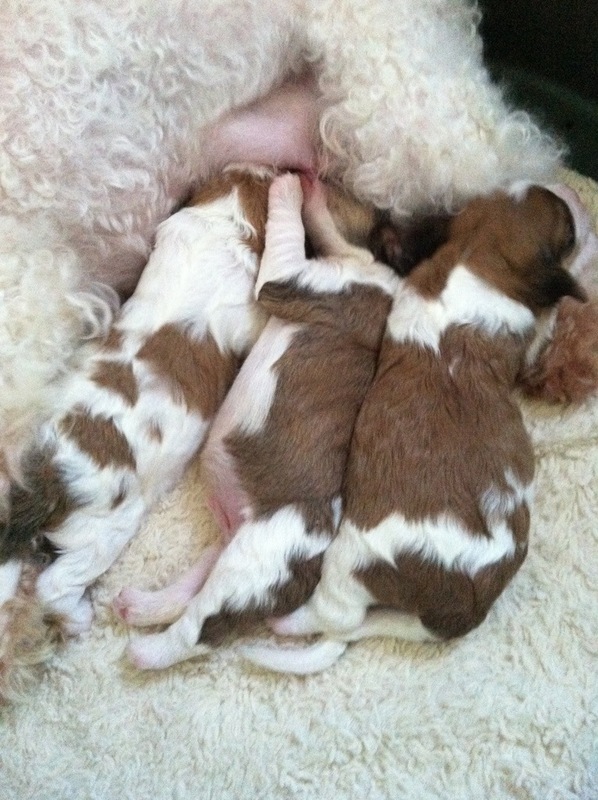 Check out the Cavachon Colors page for photos of the different colors! Just wanted to give you a progress report on Annie. She’s now just a little over a year, and what a blessing she has been in my life! We are constant companions (she never lets me out of her sight) and she has grown into a beautiful, smiling happy dog who makes others smile and say, ‘what a sweet dog’ everywhere I take her. I do believe our Lord knew exactly the dog I needed, and I can’t thank you enough for helping that to happen! Hopefully this picture will get through.